Yes, I’m talking about underwear again. If that makes you uncomfortable here are some videos of munchkin cats you can watch. This is my second hand-made bra! And I can already tell that I’ve improved soooo much since the first bra I sewed. Pattern: I used Kwik Sew 3300 Version A because I didn’t want to wait for a pattern to come in the mail. Goal: This pattern is a partial band bra while the Pin-Up Girl’s Classic Bra is a full band. I wanted to try something a little different this time and it’s interesting to make the comparison in both style and my bra-sewing-abilities. I like both designs for different reasons. Fabric: OMG you guys!!! Ever since I started bra making I’ve been on the hunt for supplies. In fact, I’ve got a list I’ve compiled that I’ll probably post about later featuring every source I’ve found so far. Would that be something you’d be interested in reading? This kit came from Hooks & Wires on Etsy. My color is “lilac.” As of right now she doesn’t have any kits left in stock. Summerset tends to make kits in big batches and post them all at once. She’s nice, though, so if you ask she’ll probably make you a kit. Visit her sold items to see all the color options available. She hand dyes everything you need to make a bra – elastic, hooks, powernet, tricot, lace, even the little metal rings for the bra straps. In the past she’s even had wide straps available if you need more support. With shipping the kit was $20 (I live in Texas) and she even includes underwires for free, just tell her your size. I’ve only found one other kit that is cheaper but it doesn’t include any lace trim. ***Two things of note – She only includes about a yard of strap so for a bra like the Pin-Up Girls which only uses a small amount of strapping (the front has self fabric straps) but for this Kwik Sew bra I used all the strapping in the kit and if the tops of my bra cups were much shorter I’d be out of luck in the strap department. Also, the lace is only 3″ wide so if you wear any size bigger than a b-cup you probably can’t use this lace with Version A of this pattern. But you can always use the lace as a trim with another pattern! Changes: The pattern calls for power net bands and tricot and lace cups but since I don’t really like the look of power net I layered some tricot over the power net and stitched the elastic over both fabrics so it has the support of power net but the nice smooth look of the tricot. The pattern also shows you how make your own straps but since I had strapping I skipped that part. If you use Version A Kiwk Sew asks you to get some sheer nylon to back the center lace bit. I just used another piece of power net behind the lace. 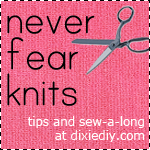 I also nixed the 3 step zig zag because I like the way the regular zig zag looks and it works just the same. Results: It fits! It’s fits quite well, even better than my first bra I made. I love that this bra has strap adjusters in the front because I hate taking a bra off or fighting with it to adjust the back straps! I still have some confusion as to how to attach the wire casing but I figured it out, even if it isn’t the way the directions say to do it. This pattern is pretty full-coverage, at least for me. I don’t have much that needs covering, I guess. Next time I might adjust the cups to be shorter. Oooh, I see a foray into bra pattern drafting in my future!! With pattern and materials this bra came out to about $30 and considering that I usually spend at least $40 on bras from the store I’d say this is both a fun and cost effective project! Previous Article← Decoding the Derriere, or, have you read the word “crotch” enough today?